Kit Woolsey’s first book for some time, The Language of Bridge has been named Book of the Year by the IBPA. That was reason enough to see how his team was performing. In round 9 they found themselves up against the undefeated leaders. 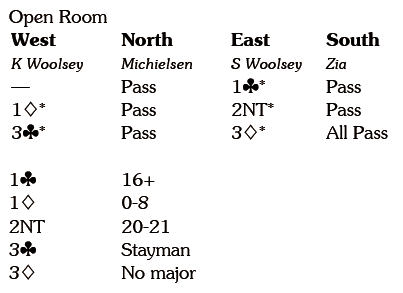 North led the Q and declarer won with dummy’s ace and cashed the A on which Zia dropped the queen. Declarer pitched a spade on the K and ruffed a club with the 9, North overuffing and switching to the 2. Declarer took dummy’s ace and as the card lie now does best to play another diamond. South will win and probably play a spade, but declarer can win, cash another spade and the K and then ruff a club. North will overuff, but have to surrender a trick to the 10 at the end – only one down. In practice declarer played a spade to the king, crossed to dummy with the A and ruffed a club. North overuffed and returned a diamond to South’s jack, his three black suit winners meaning three down. South led the 5 and declarer ducked the first two rounds of the suit, pitching a spade form dummy. 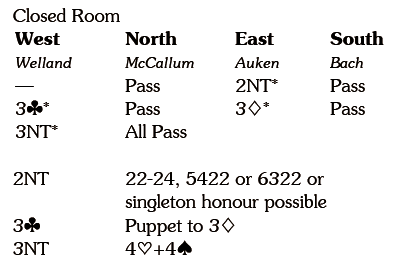 South switched to the Q and declarer won in hand and played three rounds of hearts. When nothing good happened there she could not avoid two down. If you want a little exercise, see if you work out how declarer can escape for one down. I’ll give you a clue, it requires you to ‘divide and rule’. The combination of the mini notrump and the natural weak take out left North with little choice. East led the Q and there were only eight tricks. 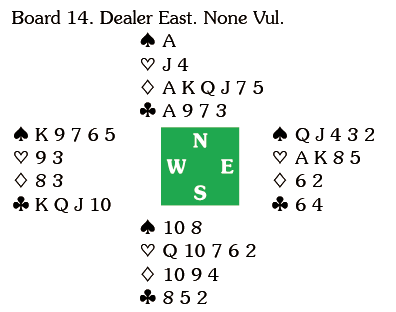 East led the K and switched to the Q, declarer winning with the ace and playing the J. East won with the king and now faced a critical decision. West had followed to the Q with the five, and was known to have a doubleton heart. Did the defenders have a spade trick to cash? 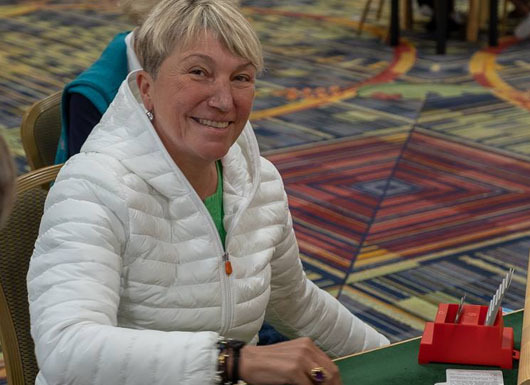 Declarer was known to have at least nine cards in the minors, but would she have overcalled 4 on a five-card suit? 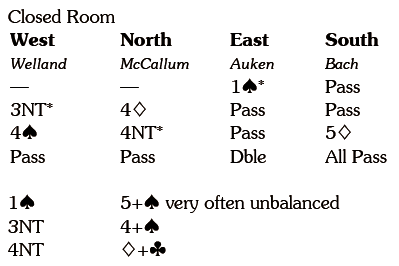 On this layout you have to play back a heart so that partner can ruff and kill a potential discard. When East played a spade declarer was home. That result helped Kit’s team on the way to a famous victory – they were the only ones to lower their opponent’s colours in the qualifying rounds.